Construction defects in homes cost millions of dollars every year and place people’s health and lives at risk. Everybody’s Building Code helps people determine if they and their contractors are complying with the important structural, health, safety, and energy efficiency requirements of the International Residential Code. Everybody’s Building Code is for homeowners, contractors, real estate agents, home inspectors and everybody else who wants to understand the International Residential Code without wading through the dry and often confusing language of the code itself. Everybody’s Building Code states code requirements in direct, command oriented statements and provides many examples, illustrations, and photographs that demonstrate how to apply the code requirements. In cases where the code requirements may not reflect current best practices, the book discusses some opinions on the subject and directs the reader to other sources for more information. The book contains an extensive key word index and a detailed Table of Contents to help readers find the code provisions they need. 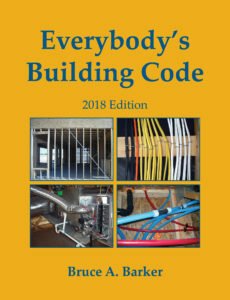 To purchase Everybody’s Building Code (2018 Edition) for $79.95, click here. To purchase flash drive of Everybody’s Building Code Book and Illustrations (2018 Edition) for $149.95 click here. Bruce’s highly illustrated book is reader-friendly, yet detailed. A great quick reference for anyone who might want to design, build, or remodel a home. As a former Architecture, CAD, and Woods teacher, I would highly recommend this book. As a Residential Home Inspector “Everybody’s Building Code” by Bruce Barker is a valuable reference tool that is loaded with information that is easy to read and understand. The in depth Table of Contents makes it quick to find what you are looking for, and the simple Illustrations, diagrams and charts help to give visual examples in each section. I use the definitions, terms and explanations in this book to help with my report writing, giving my clients a better understanding of building practices and codes that may apply to their homes. Thank you Bruce for writing a book that makes building codes easy for everyone to understand. Ever wish you had a residential code expert on staff when working with local building officials and inspectors? Now you can. “Everybody’s Building Code” is your project reference. Its complete Table of Contents and Index make searching for relevant code sections quick and easy. Each chapter provides definitions of complex terminology and Best Practices. Clear and easy to use charts and tables are provided through out. Use this book for a few days and you’ll wonder how you ever got along without it. Since purchasing your book Everybody’s Building Code at Inspection World 2010, it has been the go to resource for my inspection business. The book contains the information I need to provide an accurate and comprehensive report to my clients. The easy to understand language and helpful illustrations saves time and eliminates confusion about the building code. Thank you. Bruce is the expert I rely on when it comes to protecting the interest of my buyers. I certainly could not imagine a better, more qualified person. Is your project up to code? Would you know if it wasn’t? Well, get a copy of Everybody’s Building Code, and you’ll have a quick reference to hold yourself—and your contractors—accountable to the International Residential Building Code. The book uses straightforward language and plenty of illustrations to help you understand how to apply the building code to all of your home improvements. This book makes the International Residential Code easy to understand. It is a must for every homeowner’s library. I just want to say thanks for all the information you have provided me with over the past few years. You are a valuable resource whenever I have a question regarding building codes. I appreciate your wealth of knowledge and professionalism. I always have your book “Everybody’s Building Code” with me at each inspection I perform, it’s my Bible. Thanks again. If you want to do it yourself, you want to do it right. You don’t want a code violation to cause you a problem when you’re trying to resell, and you certainly don’t want to make a mistake that will result in something unsafe or dangerous. So, how do you find out what is right? In my experience, there are two problems with most building codes. Finding the relevant rules using the code’s limited table of contents and skimpy index is one problem. Understanding the rules in the maze of tables, footnotes, and legalese is the other problem. This author has solved both problems. Between the table of contents and the index, it is relatively easy to find what you need. Once you’ve found the right section, the clear writing, the liberal use of examples, and numerous pictures and illustrations help you understand the code. After looking up a little about the author’s experience, I decided that this book belonged in my collection. He has the experience, and he explains the material clearly. Now I have a reference that I can use in two ways: 1) when I need to find out about a provision in the code, I use the table of contents to find the relevant section. 2) when I need to work on something specific, electrical, for instance, I use the index to guide me to the right place. A thorough reference guide that explains code requirements for residential buildings, top to bottom. Barker, licensed contractor and president of a building inspection and consulting firm, has compiled complete summary and explanation of the international residential code, or IRC. This book is not a how-to manual for residential construction, though Barker does provide brief tips on locating a qualified contractor. Designed to supplement the IRC as an easy reference for contractors, inspectors and real estate agents, the book examines each aspect of the IRC in clear detail. Barker ably addresses each topic and provides a glossary, photographs, tables and labeled diagrams to supplement the material. The guide covers the requirements for a residential building from bottom to top, including material requirements for a foundation; interior and exterior wall construction; roof and ceiling requirements; energy efficiency; and plumbing and electrical. Drawing on his experience in the building trades, Barker stresses topics that he considers to be of great importance, such as flashing. Additional topics such as radon, broadband wiring and manufactured homes appear in the appendix. Designed to allow quick reference, this manual includes a table of contents that is a complete outline of the chapters and subsections, as well as an index and a global glossary that defines building materials and parts from baluster to rabbet as a supplement to the topic glossaries. The writing is straightforward and concise without embellishment; instructions are precise and the reader is referred to the local code when necessary. Barker provides example calculations for many operations to ease the transfer of information from words to practicality. An easy-to-follow, complete reference recommended for anyone involved in the construction or remodeling of residential buildings.